The World Health Organization introduced the Surgical Safety Checklist (SSC) to improve patients' security in a surgical treatment . The idea of checklists is established in different areas of safety culture, for example in aviation to improve passengers' security. The SSC was first introduced in 2007. Meanwhile it is worldwide used in developed as well as in developing countries  to reduce the complication rate in the operating room. In the Department of Cranio-Maxillofacial Surgery of the University Hospital Graz it is used since 2011. The well-structured checklist ensures safety standards for the patient and the personal. After a time of conversion and adaption there can be seen an amendment in daily routine. The samples of 41 SSC of the Department of Cranio-Maxillofacial Surgery were taken at three points of time in a period of 16 months (February 2013 till June 2014). At the beginning in Februrary 2013 (point 1) 58,33 % (7 of 12) were complete and correct filled, the rest was incomplete. After a period of 8 month at point 2 100% were incomplete, 7 month later there was an increase in completeness up to 75%, but also one surgery without using an SSC. The first random sample results of using the SSC shows a variance in the amount of completeness. After implementation acceptance of using and correctly documentation has to be exercised and reminded. The well-structured procedures can prevent adverse events in the operation room by improving the team communications . This result was seen even in different continents and under various economic circumstances. It is a tool without additional costs like personal resources and the experiences all over the world showed a reduction in perioperative morbidity and mortality. Within our department the acceptance of the SSC increased over time . 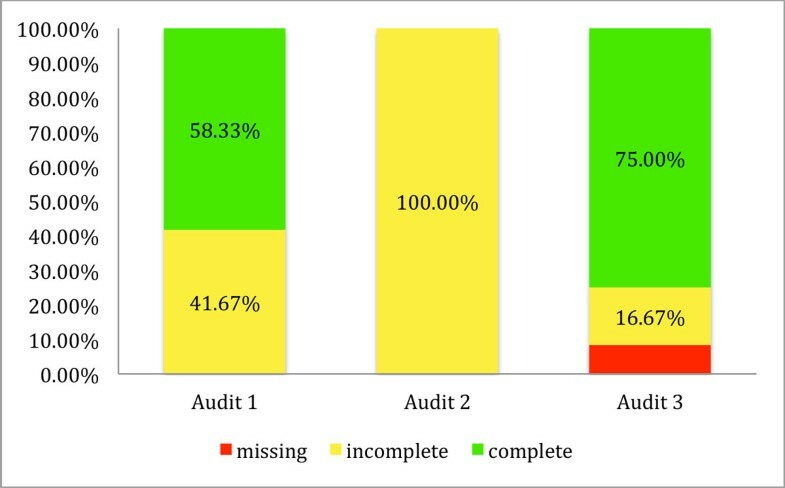 Evaluation of completeness of the Surgical Safety Checklist at three points of time.